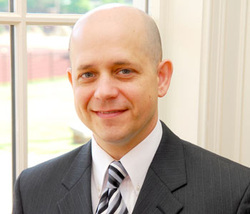 Dr. Danny Frye is the Director of University Bands and Instrumental Studies at High Point University. Since his arrival at High Point University in 2009, the number of instrumental faculty has increased 467%. In addition, the number of students participating in instrumental ensembles and lessons has increased 510%. Under the direction of Dr. Frye, the HPU bands have positioned themselves as the most visible musical ensemble on campus, appearing at on- campus events, community events, on live streams of their performances, and on national television. In May 2014, the band is embarking on its first recruitment tour. Prior to his appointment at High Point University, Dr. Frye was the Assistant Director of Bands at Wake Forest University, the Instructor of Percussion at Pfeiffer University, and the Instructor of Percussion at The University of North Carolina at Charlotte. In addition, Dr. Frye taught high school band in North Carolina for eight years. Dr. Frye is an active adjudicator and clinician with bands throughout North Carolina. In 2010, Frye had the privilege of conducting the Guilford County All-County Band. As a performer, Frye has appeared as a guest artist at the Festival Internacional de la Percusion in Puerto Rico, the Southeastern Percussion Festival, and the Kentucky, Tennessee, and North Carolina Days of Percussion. He also has presented solo marimba recitals, clinics, and master classes at the National Conference on Percussion Pedagogy and universities throughout the United States. Frye continues to perform regularly throughout NC. Dr. Frye earned his DMA degree from the University of North Carolina at Greensboro. He is blessed to have a loving and supportive wife and three wonderful children.